Discovering all the highlights of the new Mazda3 in detail before the launch of the vehicle on March 23rd, 2019 and configuring the car according to your own individual wishes? 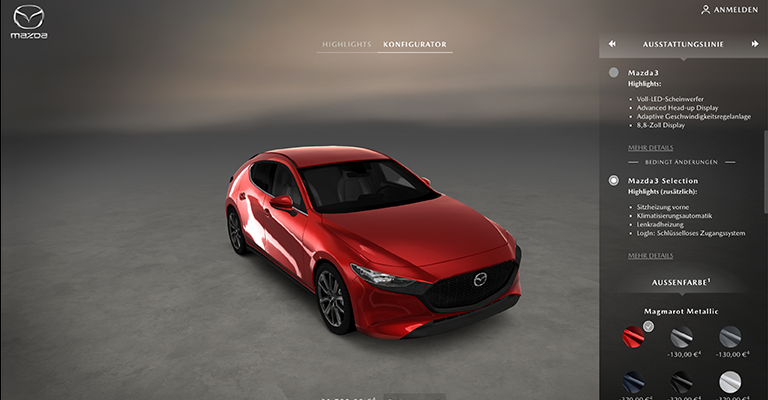 This is possible by using the intuitive, visually high-qualitative and high-performant 3D car configurator from Mazda Deutschland, which was developed in WebGL and implemented for the launch of the new model. Via Augmented Reality, interested clients will soon be able to view and configure the new Mazda3 in their own living room as well. Both, the 3D configurator and the augmented reality application were realized by the specialists from Demodern - Creative Technologies. 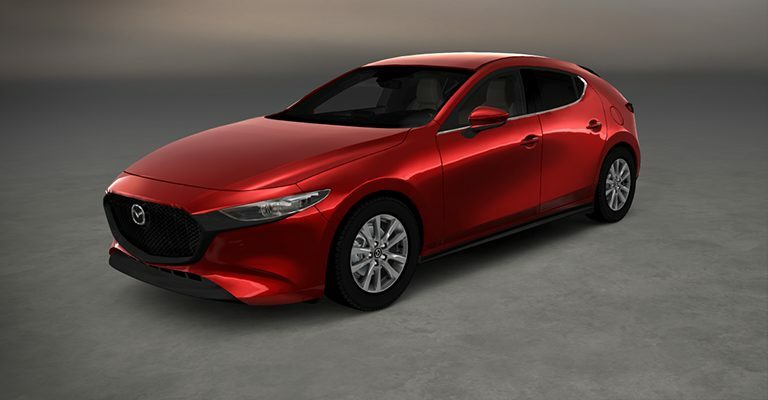 For the Japanese car maker a new era starts - the reissue of their successful model is the first car of a completely new generation of Mazda vehicles with an advanced Kodo design, innovative engine technology and a new vehicle platform. With the 3D configurator Mazda goes new digital ways: With the state-of-the-art WebGL technology, the user can view the vehicle freely and from all angles without delay and across all devices, allowing them to experience the vibrant alternation of light, shadow and reflections on the reduced body of the new Mazda3 online. Thanks to the configurable and update-capable 3D data, the application is AR- and VR-ready and thus lays the foundations in the infrastructure for further auto-configuration experiences. "Through 3D configuration, products and topics can be visualized more excitingly and individually - this quality ensures upselling in the automotive sector and an excellent brand experience. Ultimately, 3D in the browser using WebGL is considered to be one of the future technologies for high-performance, visually brilliant and interactive presentation of products and content, "explains Technical Director and Partner Florian Wögerer. "Mazda proves with the choice to bet on WebGL as one of the first that innovation for car makers does not stop in vehicle manufacturing. You have to be always up to date and show users that you belong to a new generation and think in a progressive way. Considering how relatively quickly we have implemented the tool together with Mazda and how well it has been integrated into existing systems, the potential of browser-based real-time 3D applications becomes obvious", adds Kristian Kerkhoff, managing partner of Demodern. In addition to the design experience, the new WebGL configurator also enables the user to prepare his vehicle purchase. With the help of the tool, you can choose between different colors - using the Mazda web portal at home or on the road - configure the interior, select rims and engine and choose between automatic or 6-speed gearbox. The corresponding purchase price is generated in real time. Furthermore, if desired, interested parties can also have their individual leasing or financing conditions displayed in real time. "With the launch of the new generation of vehicles, we want to offer our customers and prospects an innovative web experience that highlights the design of the All-New Mazda3 and brings it to life from different angles. 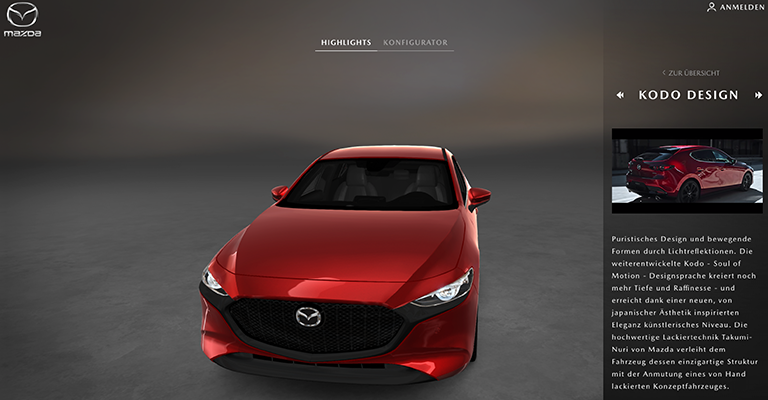 With the 3D Configurator, we offer users an interactivity-optimized online tool that puts the user experience first, "explains Georg Schulte, Digital Innovation Manager at Mazda. "In addition to the interactive user journey, the new 3D configurator also aims to optimize the transition from the online world to retail. Therefore, we offer our users the ability to request an individual offer based on their configuration from the merchant of their choice. The Mazda internal lead management system automatically transmits the data to the appropriate dealer, "Bernhard Kaplan, Managing Director of Mazda Motors Germany, continues the decision. Mazda has been one of Demodern's customers since 2015, always relying on the know-how of the service provider specialized in creative technologies. For Mazda Europe, the configurator is also integrated in a basic version in the, My Mazda' app, which is already available in 22 European countries.